I am a MA Art Museum and Gallery Studies student at Newcastle University, as part of my degree I am completing an eight week work placement at South Shields Museum. As part of my placement I have developed two exhibitions, using works from South Shields’ art collection, which will be on display sometime in 2015. Now that I am nearing the end of my placement (boo!) and both exhibitions are complete, I have been helping Adam, the Assistant Keeper of Social History, with his upcoming WW1 display Home for Heroes: South Tyneside in the First World War. The exhibition’s focus is the key role played by the people of South Tyneside during the war effort, placing particular emphasis on the stories of three recipients of the Victoria Cross – Henry Howey Robson of South Shields, Thomas Young of Boldon Colliery and Joseph Henry Collin of Jarrow. Adam asked me to write a draft panel for the exhibition about the Yemeni riots in South Shields. It was fascinating reading about the history and origins of the riots. The story begins in the 1890s when the Yemeni first began to build a strong community in South Shields. They arrived mainly to work on British merchant vessels and were the first of the settled Muslim communities here in Britain. At the start of the First World War many British seaman had left their jobs in the merchant service to join the army or navy. Arab seamen were called in to fill these vacant positions, causing South Shields’ Arab population to swell to over three thousand. Upon returning from the war, British seamen found that there had been ‘replaced’. This dispute over employment led to much racial tension. The first incident occurred when a large group of white men coordinated an attack on an Arab shop, even going as far as pulling out all of its gas fittings! More trouble was just around the corner. This knife belonged to PC Job Blythe of the South Shields Borough Police Force. 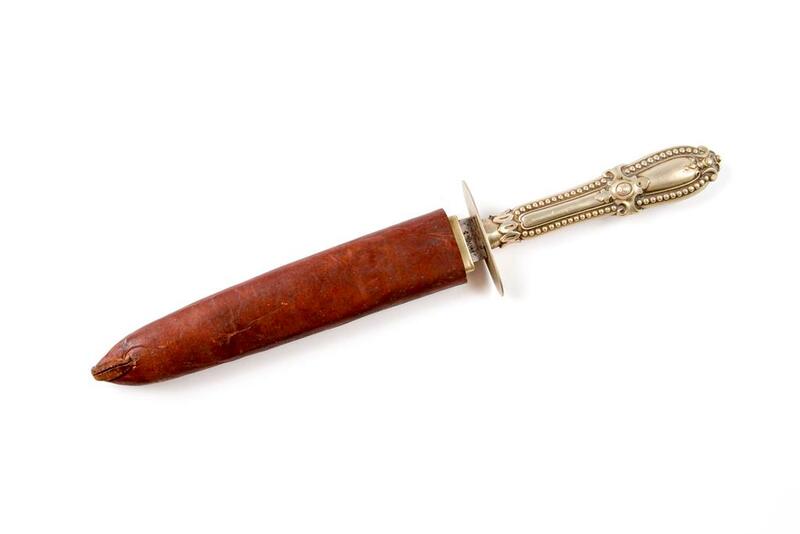 It is not known whether Blythe confiscated the knife or was given it following the first Yemeni riot. This took place on the 4th February 1919 at Mill Dam when the tensions resulted in hundreds of people from both communities clashing. For their part in the riots, eight Arabs were arrested and sent to prison, whereas no white men were charged – perhaps indicating unfair treatment on the part of the Police. This incident was the first riot in Britain, and it led to similar incidents in both Liverpool and Cardiff, which were significantly larger and more violent. Home for Heroes: South Tyneside in the First World War is on show at South Shields Museum & Art Gallery.